A powerful full-featured WAV-to-MP3 encoder. And it is a convenient ID3v1 tag and filename editor. Powerful AVI to MPG converter which can convert AVI to MPG, AVI to MPEG. ImTOO MPEG Encoder is also a WMV converter which can convert WMV to MPEG, convert WMV to AVI. 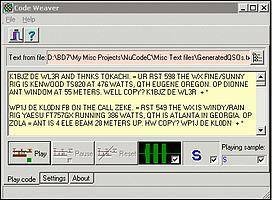 A Morse code software program that will translate text files to Morse code. It is supplied with a library of assorted sounds including Morse code at 20 to 100 wpm. The package includes other novelty code sounds. ImTOO Audio Encoder is a powerful audio converter which can convert among MP3, WAV, WMA, MP4, M4A, AAC, OGG, etc., such as convert M4A to MP3, convert MP4 to MP3.